Traders by tradition, the Bohras are an elusive and veiled Islamic community that is here represented by Sidhpur, a little-known small town in Gujarat. 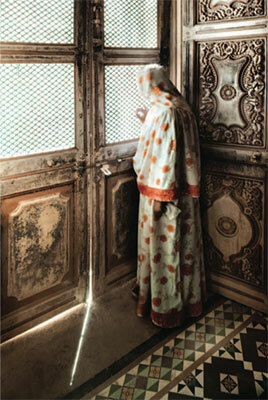 Cortés gained access to their domestic spaces and was able to capture an intimate portrait of the people but also, following his interest in architectural photography, of their unique houses that are an amalgamation of Hindu, Islamic, Persian, European and Colonial styles. This is a domesticity that resists decay and that is discerned in the residual memories, histories and traces of past lives that persist in the facades of buildings, in empty rooms, windows, doors, stairways, and other distinguishing features of Bohra architecture. In her introductory text to the catalogue, art critic Rosalyn D’Mello aptly speaks of these spaces as dioramic rooms, and pointsout that “within this astute body of work, objects are testaments and the sitters, when framed, are firmly in attendance. Both categories of inhabitants allude to that which is present and that which has past”.